Responding to the criticism that Canada may be facing a housing bubble, Jim Flaherty (Canada's finance minister) drastically tightened the nation's mortgage regulation. WSJ: - The new measures announced Thursday will take effect July 9 and significantly ratchet up lending requirements by banks and other lenders. They cut the maximum mortgage-amortization period to 25 years from 30; reduce the amount of home equity Canadians are eligible to borrow against, to 80% from 85%; and limit taxpayer-backed mortgage insurance to homes worth less than one million Canadian dollars (US$981,000). There is a reason Canadians are concerned. 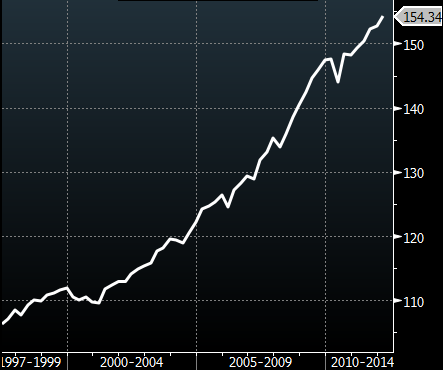 Household leverage has been rising steadily, hitting another record in Q1. Much of it driven by mortgages. WSJ: - "I remain concerned about parts of the Canadian residential real-estate market, particularly in Toronto but not only in Toronto," Mr. Flaherty said at a news conference. "That's why we are intervening once again…My judgment is we need to calm the condo market in a few Canadian cities." He said his decision came after evidence indicated there was "excessive" demand for property in some markets, and in Toronto there was "overbuilding" of condos, which he added was distorting the real-estate market. This is the right move. If the US authorities took similar steps in 2004-2006, things would have turned out quite differently.